Place 8credit from the bank on Daily Casts when it is installed. When there are no credits left on Daily Casts, trash it. 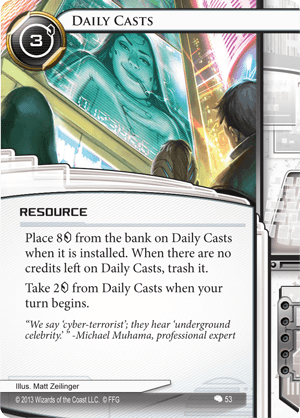 Take 2credit from Daily Casts when your turn begins. "We say 'cyber-terrorist', they hear 'underground celebrity.'" -Michael Muhama, professional expert. A really solid econ card with a couple of caveats. On a click-to-credit basis, it's equivalent to a Restructure, and one that only costs 3. However, the first turn after you install it, you're down 1 credit; the second turn, you're up 1, and it's only the third (+3) and fourth (+5) turns that it really shines. In other words, it takes 3 turns after installing it before it's any better than clicking for a credit, and it's pretty useless if you're going tag-me as any good Corp will kill it quick. It's also not ideal late-game, as the game could be over before you see the benefit of it. With that said, it's one of the most click-efficient moneymakers Runners have available. Also combos nicely with Aesop's Pawnshop, bringing the net gain to 6 credits. Staple boring economy card - completes the holy trinity with Sure Gamble and Dirty Laundry. Being neutral, and not particularly expensive or slow, most runner decks would consider using this, especially with the more offensively broken cards gone. One exception might be Magnum Opus decks, who don't care much about temporary economy as long as they can get their one card. For everyone else, this is a reliable foundation to start your econ package with, and provides backup for more specialized cards like Tech Trader or Aesop. Armitage Codebusting could be considered its direct competitor, but clicking for finite credits still feels crappy unless it's the huge payout of Liberated Account. All in all, it's a ubiquitous card that you'll need to justify not including more often than including.